The i2b team of one continues their coverage of the Big Ears Festival in Knoxville, TN. Please share widely. And if you are feeling generous, click that DONATE button over the so we can feed the copy editor. Day Two started off with a bang. The Roscoe Mitchell Trio Five, featuring Vincent Davis on drums and Junius Paul on bass. Mitchell began on alto, angular intervallic leaps with lots of space, the rhythm section responding to his prompt. Then it began to build, the phrases getting longer until the circular breathing kicked in. 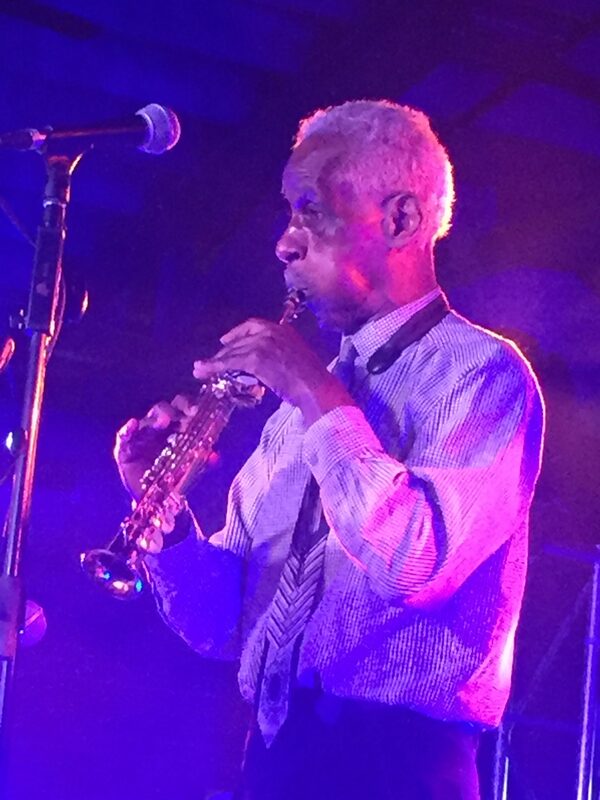 That’s when things got really compelling and the legend of Roscoe Mitchell manifested. There’s a reason he has been one of the most important musicians in the so-called “jazz” world for more than 50 years. Beautiful and occasionally terrifying, the cascades of notes became by turns molten and solid, a dense wall of sound that explored everything the alto had to offer for around 20 minutes. After a bass/drum interlude, Mitchell picked up the sopranino. Again, circular breathing set the stage for a vigorous exploration of the highest ranges of this high-register instrument. Fifteen to twenty minutes later, another rhythm section feature and a switch to soprano. Finally, a switch back to alto and the Trio brings it home with Mitchell’s “Odwalla”, a the classic Art Ensemble of Chicago walk off music since the 70s. The place was packed. Friends of mine bailed on trying to get in after pictures of the lines outside circulated on the internet machines. Inside was jammed with one of the best audiences you can imagine. Mitchell remarked later that the crowd was especially good: Rapt, deep listening people who stood patiently for the hour-plus set. Honestly, there were times when out team thought someone had slipped some psychedelics into their coffee, closing our eyes from time to time to protect against sensory overload. 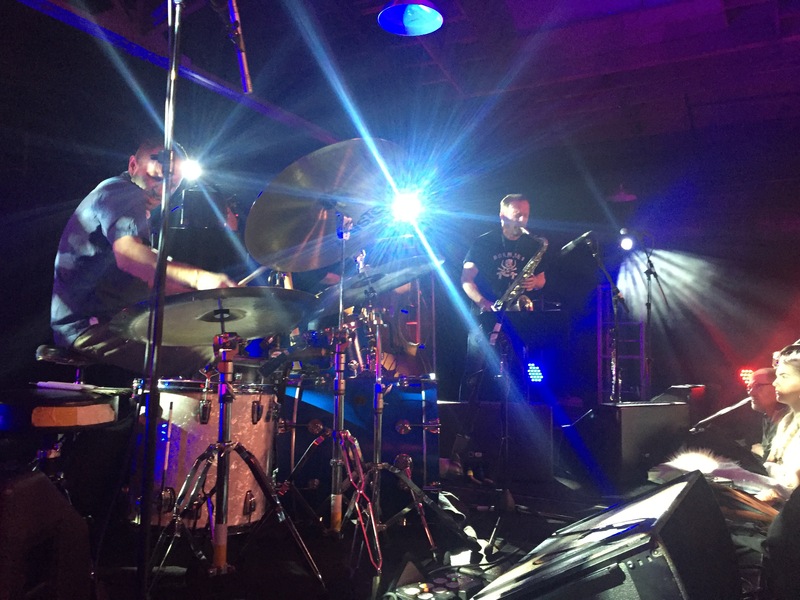 The thought occurred that we were witnessing something akin to the late Coltrane, with the relentless sheets of sound that became something other than simply notes through a saxophone. Music is a peculiar thing. The best musicians spend a lifetime cultivating an ability to excite the air molecules around us in specific ways, and somehow, those bouncing molecules can become transformational, something near-solid that transmits intelligence, intention, and impact. A quick word on bassist Junius Paul. 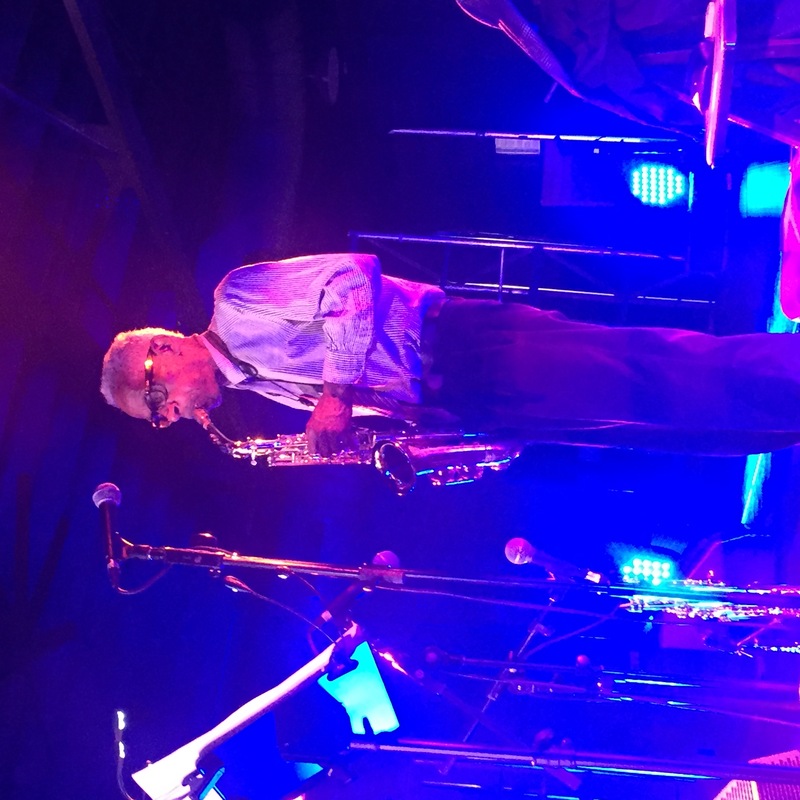 We talked before the set, and he mentioned how awe-inspiring it is to be the bassist in the re-formed Art Ensemble of Chicago, filling the role held by the late and great Malachi Favors. He can stop worrying. The Malachi chair is in more than capable hands as Mitchell readies the group for an AEC 50th Anniversary tour in 2019. Rejoice, people! Onward, sort of. We found it hard to settle into the next couple of events after the Roscoe onslaught. We dipped in and out of a few well-attended events, finally coming to rest in front of the collage films of Lewis Klahr at the UT Downtown Gallery. It was just the tonic, something to embiggen the eyes and let the ears reconstitute themselves in the new world Roscoe created. We made it to the International Contemporary Ensemble performance at the Church Street Methodist Church, another truly lovely venue undergoing some expansion construction. As the group settled into their chairs, the construction crew arrived back from lunch and set to work with their jackhammers. It actually sounded very cool, but they were offered another lunch hour so the music could continue. Various combinations of percussion, cello, harp, oboe, flute, voice, and piano took shape to explore compositions by Pauline Oliveros, Anna Thorvoldsdottir, Ellen Reid, and others. 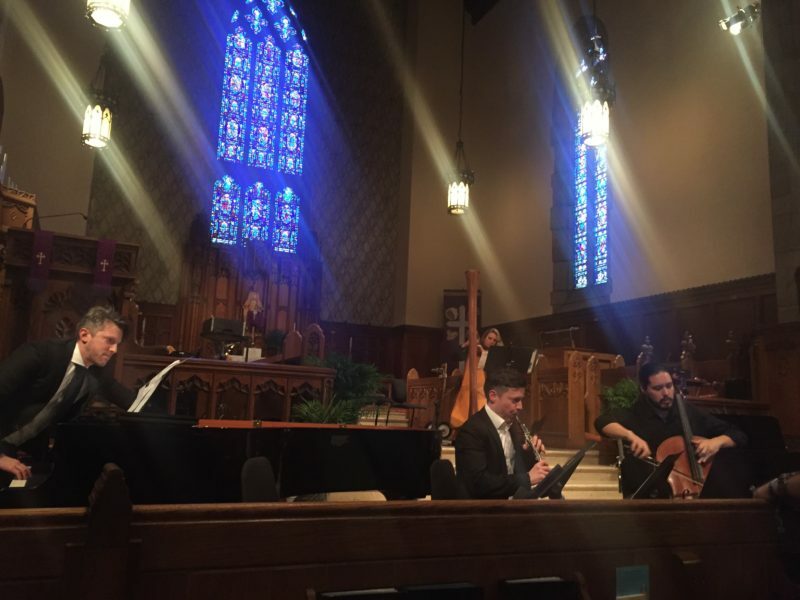 Gorgeous and very spacious music that resonated wonderfully in the church space. Next up, the legendary (that word again) percussionist Milford Graves. Graves, like Mitchell, has been part of the jazz world since the 60s. He played with Albert Ayler at Coltrane’s funeral and recorded with Sonny Sharrock, Pharaoh Sanders, Paul Bley and a gazillion more. At the Bijou Theater, Graves sat alone behind a drum kit with only one cymbal, a hi hat. He proceeded to drum and chant, calling down the Elders and Ancestors and keeping a capacity crowd on the edge of their seats. Finally, a gap for food, though it was a gap that meant missing Arto Lindsay, Aine O’Dwyer, and Ned Rothenberg. Hey, the team’s gotta eat. 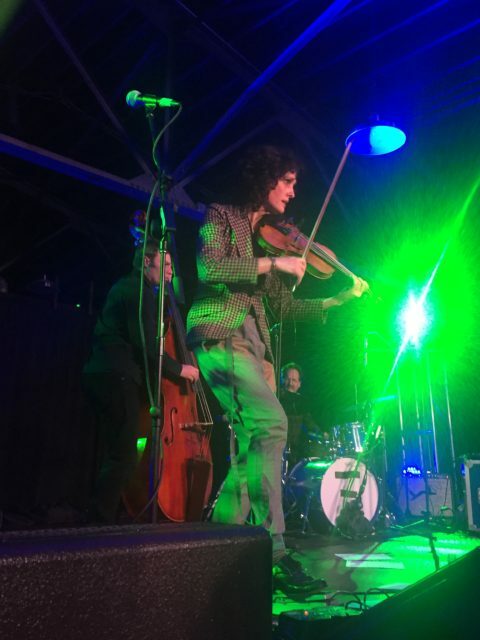 Reinforced, we dove into violinist Jenny Scheinman’s Mischief and Mayhem quartet, featuring Nels Cline on guitar. 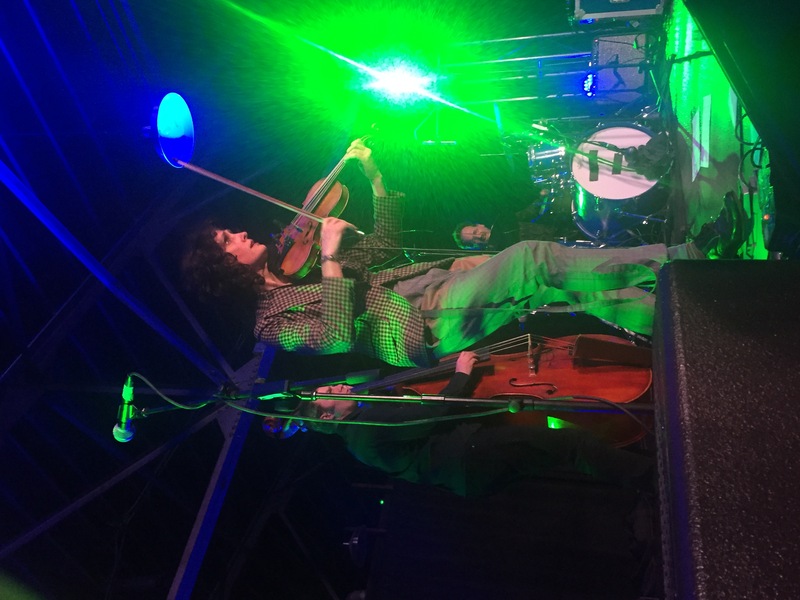 Scheinman is a radiant presence and a remarkably good improviser. Her compositions gave the band plenty of room to stretch and explore, and while the focus was largely on the melodic instruments, the rhythm section was tight and playful, kicking the front line players up a notch. Cline demonstrated why he is considered one of the world’s great guitar players, his mastery of effects matched by a strong melodic sense and a penchant for creating souuuuund. Way cool. A long walk across town gave us a chance to catch the last 15 minutes of Evan Parker’s solo soprano sax performance at St John’s Cathedral. Parker, a contemporary and occasional collaborator with Mitchell, has made a science of the circular breathing technique, and the richly resonant Cathedral was perfect for him. Again, attention was flagging and more fuel was necessary to continue. Ran into some pals who convinced me to check out Norwegian singer Susanna at the Bijou. It was a quiet revelation. Backed by a trio of harp, accordion, and violin – and guest singer Bonnie “Prince” Billy – Susanna’s high, clear voice and spare arrangements are hypnotic. 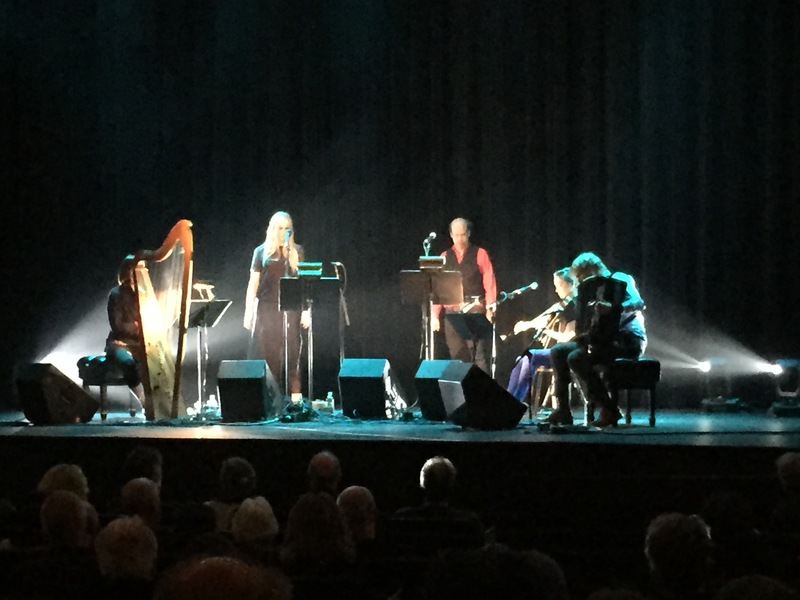 Song selections like the American folk standard “Rye Whiskey” and Leonard Cohen’s “You Know Who I Am” were recast as haunting Nordic laments. Exceptionally Beautiful. A quick dash to Mill & Mine to check out Tal National, a guitar-driven quintet from Niger. Think a stripped down King Sunny Ade show: heavy on the syncopation and interlocking guitar parts, this was shake your moneymaker music from the jump. Then down the street to hear The Thing, a Scandanavian free jazz trio featuring saxophonist Mats Gustafsson, bassist Ingebrigt Håker Flaten, and drummer Paal Nilssen-Love. This was pure energy, muscular free improv among three players who know each other – and their instruments – very well. 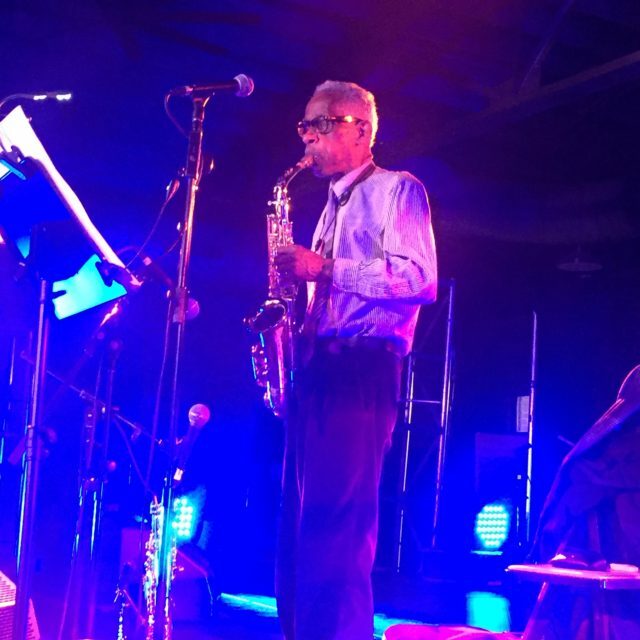 It was a fitting bookend to a day that began with Roscoe Mitchell mining the same vein in his own way, and a demonstration of the range that is on offer in the free improv world. We could have quit, but pianist Jason Moran was about to begin just down the street, so we stopped in to catch his Fats Waller Dance Party. 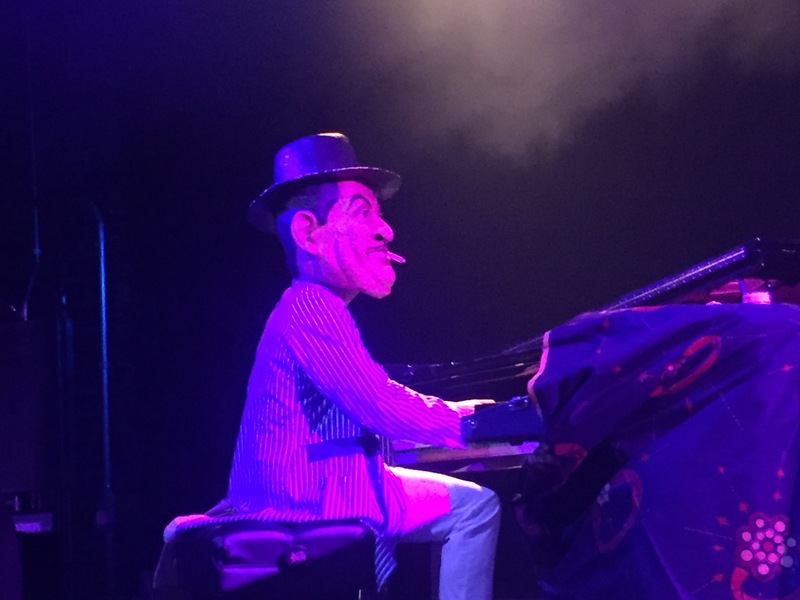 Moran is one of the music’s great players, and he can hit it in any style, even with an enormous Fats Waller mask over his head. But his introductory segments to “Honeysuckle Rose” and “Ain’t Misbehavin” raised expectations beyond what Waller’s catalog re-imagined as hip-hop could support, at least to these old man ears. Get off my damn lawn. Staggered, the team fell abed soon after, and no amount of flogging could induce the writer to write until this morning. Day Three dawns with an embarrassment of riches on offer, a series of impossible decisions, and rain on the horizon. If this ain’t living good, ain’t nothing that is.